sometimes I think that I can fix everyones problems. I think it’s my responsibility and then I stress out when I can’t fix it. I think I’m the one stop shop for fundraising efforts. haha. Our lives & eyes have been made open to the need around this world. the poverty. the orphans. and we have gotten to know some really amazing people on this journey that want to step into that need. to go on mission trips, to adopt, to sponsor, to give. all of those things require money. I hear about it all the time & this past week I heard from several good friends about the money they need to raise. $3500, $11411, $5500, $7000….money! to adopt. to go on mission. this is where I try to fix everything & be the one stop shop. I feel burdened. I wish I had all the money in the world to give to them. While I don’t have all the money in the world, I know the One who does. 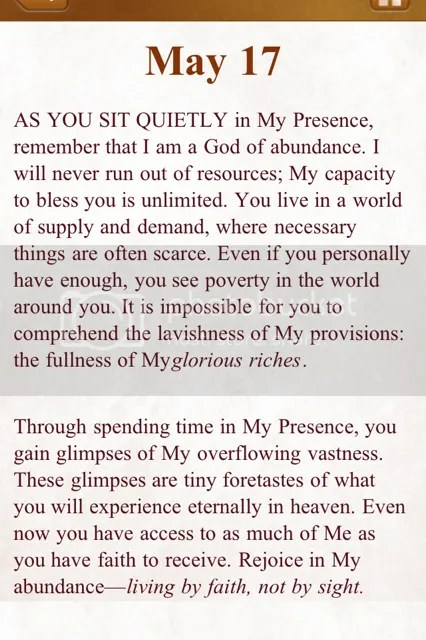 He really is a God of abundance. I was trying to take it all on. Feeling the need to give, to fundraise for them, to help come up with ways to reach their fundraising goals. but only one thing was required. I was feeling this burden to DO SOMETHING and happen to be sitting in my car waiting on someone & opened up my Jesus Calling app. this is what it said that same day….. So I will do that 1 thing. I will remember that He is a God of abundance. I am going to trust in Him. I am going to pray expectantly for what He is going to do. I am going to thank Him in advance because I know He will provide. so many stories of Gods faithfulness to provide. here. here. « africa travel must have list. Hi, your blog really touches me, have been reading it for awhile… Just wanted you to know about a website i started ReadYourBiblesChurch.com… It’s a place for Bible study guides.. I also put a forum in that can be viewed from a mobile device.. I couldn’t find where to contact you privately so I’m commenting, hope that is okay. 🙂 God Bless!